Giving a quick look back, like most years, it’s had its ups and not so ups. There has been a lot of transformation here at Shaman’s Grove with a new deck on our house and the retreat getting built (not done yet, but at least housing is in place). We started square dancing in January and love it. It’s been a hoot. We visited the kids and friends in AZ and our daughter, Kim, has visited us twice this year. And Gary (our contractor) and Gary built a new deck. It was like watching two little boys building a tree house. The garden yielded a bountiful harvest which kept me canning and preserving late into the fall. In fact, I still have tomatoes ripening in the spare room. Gary has traveled about doing individual retreats and playshops, while I keep the homestead running. And of course, on that “not so up” side of the scale was the gardening accident that brought with it a concussion and a time of healing and growth (again, not done yet, but getting there). Hmm, healing and growth … guess that pulls that part over to the good side, huh? We also lost most of our chickens this year to the local wildlife and a few of our Tree People to the drought. And there has been so much in between. Our goals for 2016 … get the retreat finished, play, take my beekeeping apprenticeship (starts 1/20) and get my hives in place, play, take a trip to AZ to visit family, play, complete the healing process for my crazy head, play more, plant a huge garden, play in that garden, build a new chicken coop and get new chicks, play with those baby chicks, take a cruise to AK, oh – lots of play there, and oh yeah – a few playshops and some travel, play more … Do you see a theme here??? Yup, 2016 is going to have a better mix of work and play. We’ve finally figured out the work will still be there after we’ve taken time to play. It’s only taken us 60+ years to figure that out. You are welcome to learn from our experience. Recently I had a few moments to cruise Facebook (don’t do it often) and found this neat idea about a “Good Things Jar”. Sounded like a good challenge to offer up to our friends (and ourselves) for 2016. As we all know, we humans tend go through periods of looking at their lives through “Eyore Eyes” – “Woe is me”. But like our list above shows, there are always good things that happen, though some days they are seem small. Often I suggest to clients that are struggling with seeing the bright side to keep a gratitude journal. 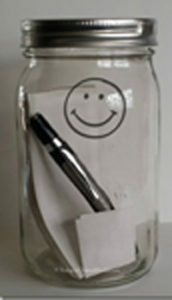 The Good Things Jar, I feel, is a great idea as it creates a visible reminder that life is good on those “down days”. (Although the gratitude journal is still a good idea). So, here is your challenge for 2016 … Create a Good Things Jar. Just get yourself a jar (get a good size jar – not a tiny jelly jar, maybe a half gallon or gallon jar, but any jar is good. You can always pour them into a bigger jar if it gets full ☺), a pen, and some small pieces of paper. Spend some creative time and decorate your (or not – just Google “Good Things Jar Images” for more ideas if you need them). Smudge your jar and ask a blessing on the jar that it be “stuffed” full by year end. Now place it somewhere you will see it. Throughout the year, fill the jar with notes about all the good things that happen, big and small, being thankful for each as you place it in the jar. You can have a jar all for yourself. You could even have “His ‘n her” specific colored papers. The family can each have their own jar and/or capture family milestones throughout the year, together. You could even put one at work and have everyone put in it workplace ‘wins’, pranks and laughable moments. And here’s where the Law of Attraction comes into play … The more we focus on these “Good Things” and are grateful for them, the more “Good Things” we attract into our lives. This is also why it is important to put the jar where you can see it. On New Years Eve, create a little ceremony and open the jar and remember all the awesome and exciting things that happened in 2016. Have a good laugh, and thank the Spirits, Guides and Allies that supported you throughout the year. You can choose to keep a scrapbook with all these papers or do a fire ceremony and burn them with thanks and joy. “Wash (smudge), Rinse, Repeat” for 2017. Sound like fun? Are you up for the challenge? Post in the comments below if you’re taking the challenge and send me a picture of your jar. Gary and I (and our Allies/Guides of course) will vote on our favorite jar(s) on February 1 and send you a little prize. Okay, the fact that you may not read this on January 1 is no excuse. You can start this project at any time. To all of, our friends, we wish you a “full Good Things Jar” for 2016.